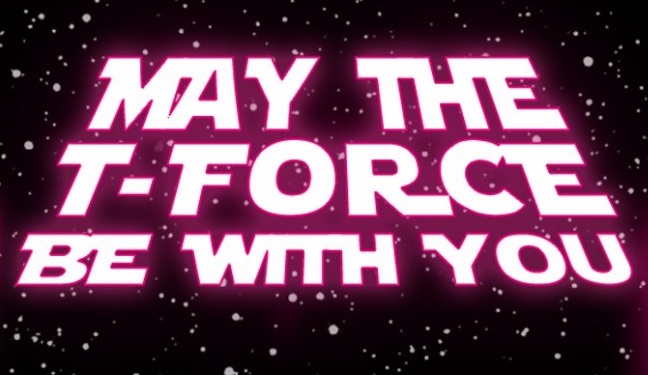 Happy May the Fourth, from everyone here at the Un-carrier rebel base! Last year at this time—you might remember—we unmasked AT&T as the DeATTh Star. This year, we’re marking the day in a different way by honoring T-Force (see what I did there?) our awesome team of social media customer service pros—and some of the fastest, smartest problem solvers on the Internet. You may have noticed that I’m all in on social. It’s where our customers are, so it’s where we are. And that goes double for our award-winning customer service team. So many of our customers prefer to get help on their social platform of choice and we want to give them the support they want! For example, in 2014, Un-carrier customers posted about 660,000 questions and comments to T-Mobile on Facebook and Twitter. So far this year, our customers are posting that much every month—and we’re on track for a total 7 million posts by the end of 2017. They ask, we respond. Recommendations? Questions? Help needed? That is what our Care organization is all about! That’s why we have T-Force as a key part of our customer Care team, and it’s why this group of talent is growing like mad – from 7 just a few years ago to over 200 social care jedi on T-Force. It’s absolutely critical that we are where our customers are and this team makes that happen! How are the men and women of T-Force handling this massive shift to customers communicating via social? They’re crushing it. In fact, they’ve dramatically cut wait times by 10x—from 30 minutes three years ago, to just 3 minutes today. And T-Mobile customers are happier and more satisfied than ever. In fact, they’re the happiest wireless customers in America, and they routinely give T-Mobile’s customer service top marks. How’s all this T-Force success possible? Because T-Force is a team of real people. Not Bots!! Real humans to help our customers out! You can see this for yourself when you interact with them on Twitter. T-Mobile was first to launch Custom Profiles in Direct Messages. Whenever you get help, you see a profile and a picture, so you know who you’re chatting with. (Protip: check out the T-Force Twitter page today for some awesome Star Wars fandom.) It sounds so obvious, but when customers know they’re speaking with a real person—and not some human-cyborg relations —they’re happier! And it’s possible because T-Force is armed with state-of-the-art technology. Like Social Bind, developed exclusively by T-Mobile to equip T-Force with real-time information assembled from across social and T-Mobile data sources. This patent-pending T-Mobile technology has had a massive impact on reducing the time-sucking back-and-forth once needed to gather basic customer data. Given the pivotal role social plays in our success it blows my mind that only one-third (32%) of US companieshave dedicated social care teams. The other two-thirds are missing a HUGE opportunity to better serve their customers! But social media isn’t the only place we’re connecting with customers. Turns out customers want to connect with brands like they do with everyone else in their life. Big surprise, right!? So we brought customer service support to messaging and now have had a whopping 1.69 million conversations over messaging within the T-Mobile app. And guess what? We’re leading the industry (again) in providing customer service and support via messaging, too. Notice a pattern? At T-Mobile, we’re committed to meeting our customers where they are. So today we celebrate the excellence that is T-Mobile’s T-Force team – as we mark this fun and fantastic holiday! May the T-Force be with you—today and always! And remember, We Won’t Stop! Thank you to T-Mobile for the press release and image.